Quantitative analysis of metabonomics techniques, combined with advanced statistical approaches, could enable the development of a metabolic profile that characterizes early changes of specific organ functions. Blood or urinary metabolic profiles, might be closely related to pathophysiological status of the organism and can be effectively studied by metabolomic approach. Two approaches are used during study, namely non-targeted and targeted metabolomics profiling. Targeted analyses includes modified nucleosides, pterines and pteridines profiles from urogenital tract cancer patients and healthy controls. Also, urine samples were qualitatively and quantitatively analyzed using LC-TOF-MS and LC-MS/MS, respectively. Simultaneously blood and urine samples were collected from healthy controls and cardiovascular patients. The aim of our study was to verify if non-targeted or targeted metabolic patterns may be treated as a useful approach to discover a biomarkers of diseases diagnosis, progression or therapeutic outcomes. The U-Mann Whitney test was used to distinguish differences in the concentration of metabolites in blood and urine. Comparison of mean values from the analyzed groups, revealed statistically significant differences (p < 0.01) for most of the metabolites studied. In case of urogenital cancer diseases observed elevated levels of metabolites mean values in urine are between 1.5 and 2.0. The sensitivity as well as specificity of the statistically significant metabolites calculated with the use of PLS-DA, K-NN, SVM or logistic regression for data obtained from LC-TOF-MS were in the range from 54 to 92 %, and from 38 to 86 %, respectively. The sensitivity and specificity for data obtained from LC-MS/MS were lower and ranged from 62 to 89 % as well as from 28 to 67 %, respectively. The metabolomic approach developed here confirms significant relations between the changes of metabolic patterns and the presence of diseases. Based on the non-targeted metabolomic profiles patients with resistant hypertension might be distinguish from other patients. Dr. Michal Jan Markuszewski works in the Department of Biopharmaceutics and Pharmacodynamics, Medical University of Gdansk, Poland. His scientific interest comprises the metabolomics, cancer biomarkers, pharmacokinetics, application of separation techniques for pharmaceutical analysis (LC-MS, CE-MS) and bioinformatics. Author of more than 65 published peer-reviewed publications (total number of citation 1067 and h-index 19 according to Web of Science, 2013-10). 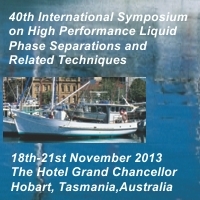 More than 20 invited lectures during international symposia and conferences. He has coordinated/participated in several research projects founded by Polish and international institutions over the past 10 years in the areas of metabolomics, toxicology and analytical chemistry.